I’ve unboxed a lot of products for the past four years since I started this blog. Without sounding too cocky, I do believe that you take my writing merely as a reference only, since there are many other sites who review similar products and offer detailed information about them. This time, it’s the Mazzer Mini Electronic Type A, which is one of the well-known grinder manufacturers used by professionals and home baristas. 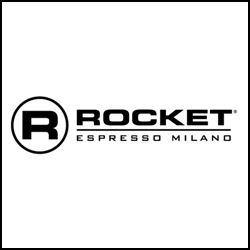 But the one I’m unboxing is a re-brand from Rocket, even though specification-wise, there aren’t any difference whatsoever, except for its name. Mazzer doesn’t have any official distributor, so anyone can import this grinder, including its most high-end product, the Robur Electronic, which costs around three thousand US dollars. 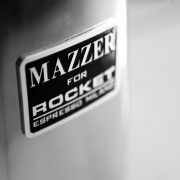 Except for Mazzer for Rocket, which is distributed by PT. Tritama Kawanmas, who also imports machines under the same name (formerly known as ECM). 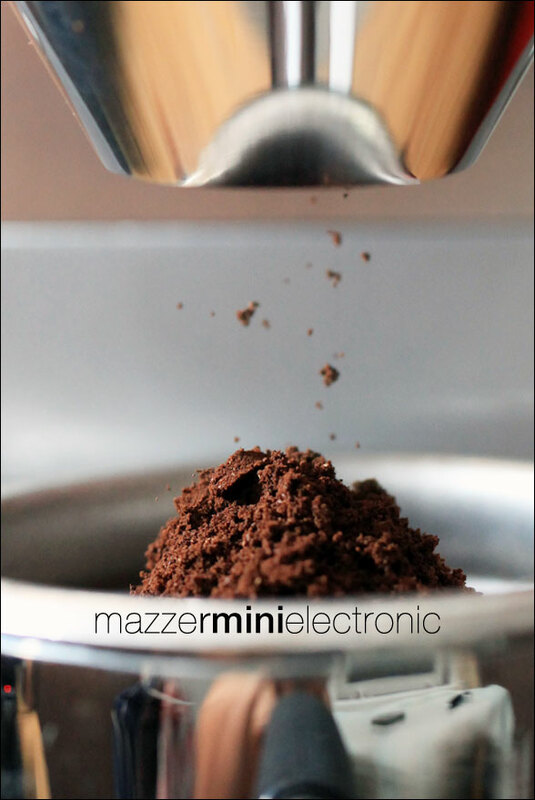 For this post’s purpose, I will call it with its most common name, which is the Mazzer Mini (MM). Essentially, the Mazzer Minis are available in two kinds; doser (with ground coffee container) and doserless (without ground coffee container). The doserless are further divided into two types – type A (using electronic panel) and type B (panel-less). 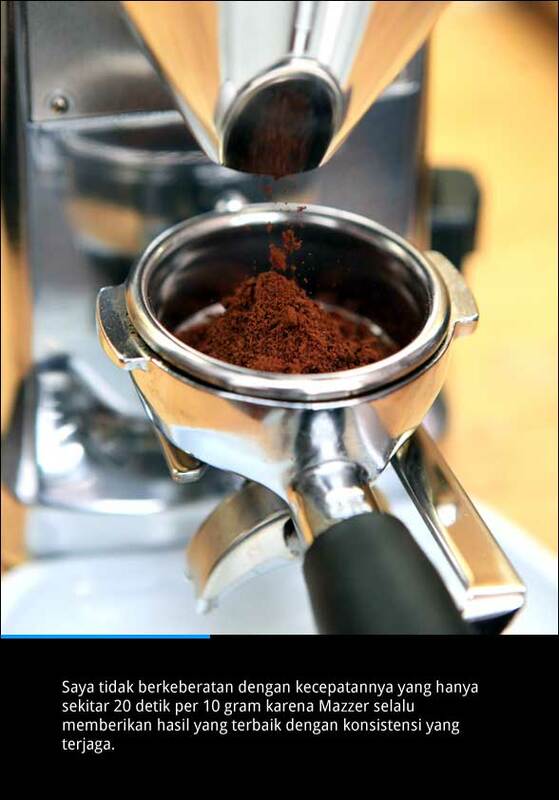 On the type B grinders, the timer is adjusted manually using a screw that can be rotated to add or reduce the dosing time, as well as an automatic switch that activates the grinder when the portafilter is pressed under the doser. 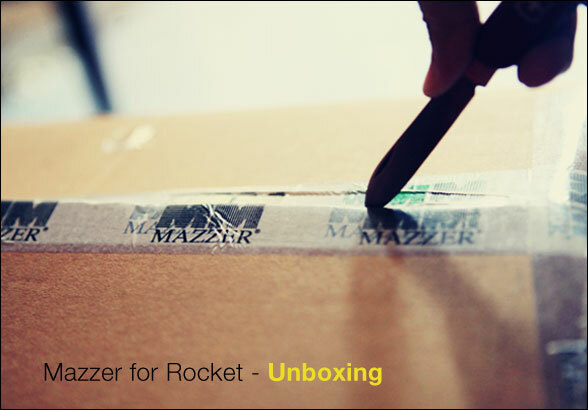 Unboxing Mazzer really brings me back to the first time I became seriously interested with coffee, and read many reviews who were talking about this particular product. It was meant to be paired with Rancilio Silvia, as what many home baristas would. Silvia and Mazzer Mini are indeed the ideal couple, although the grinder costs more than the espresso machine – something that I actually recommend. I’m sure you still remember the principle I always hold; prioritize on buying a good quality grinder before buying any kinds of coffee machines, and always provide a sufficient budget for it. Rocket coated MM with a shiny chrome finishing and excellent craftsmanship quality, which is evident from every curve and corner of this grinder. 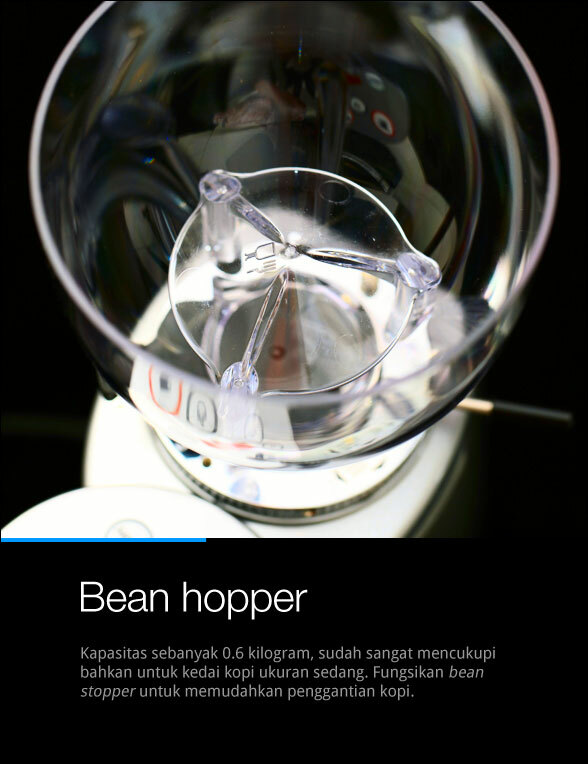 Starting from the top, the bean hopper – or the bean container – is made of clear plastic material with an ideal 0.6 kg capacity. The bean catcher completes the container’s feature to ease changing the beans. Its 45 cm height will fit most home cabinets so you can put this grinder just below it. In the middle, there’s the burr collar that sets the coffee grind mode (coarse or refined) and it comes with a 7 cm long handle. A sticker showing an arrow pointing to the left indicates fine grinding and the one pointing to the right indicates coarse grinding. Try to move this part and you’ll find that it’s not easy to do it as it takes a bit of a power so the burr position changes. 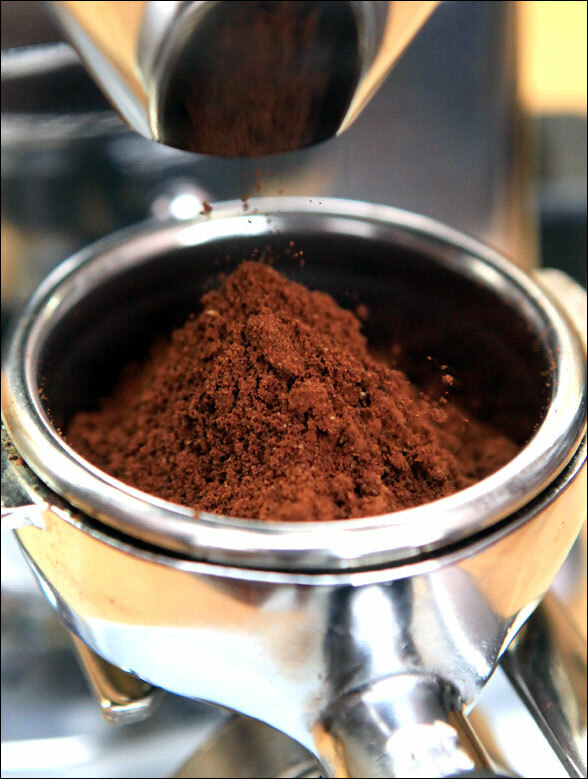 From all the grinders I’ve tried before, Mazzer is the grinder that requires the most power to change its burr. The limiter screw can also be used to tighten the burr collar so it doesn’t change. Image 4: Electronic panel The panel on the cone’s surface shows the dosing options for one or two cups. Manual button is indicated with the finger pointing icon. To access the menu simply press the first button on the left. Next to it is the electronic display, and the time adjustment buttons to increase (+) or decrease (-). Maximum dosing time to set is 30 seconds for either one or two cups. Let’s move on to the electronic panel, which is MM’s main kitchen. On the panel, we can adjust the timer for 1 or 2 cups of dosing. The Menu button must be pressed, and when the electronic displays ( _ _ _ _ ), press the button that shows a single cup, then adjust the time as desired. The display shows four digit numbers with two decimals, for example: 15.35. Adjusting it is possible only by decreasing or increasing for as long as 0.5 seconds only, and this is done by pressing the (+) or the ( – ) button. Unfortunately, the maximum time it allows is limited to 30.00 seconds and afterwards it will go back to 0. I tried grinding 10 grams of coffee and the MM took around 20 seconds, which was relatively slow, wasn’t it? Perhaps some of you have similar experience as mine, when I first struggled to find the ideal grinding results for my coffee. At that time, I rotated the burr starting from the coarsest setting, and it took me 30 minutes until I could finally get the result I wanted. That method turned out to be very ineffective, so I did it the other way around and started it from the most refined setting. The burr must be changed bit by bit, starting from the most refined setting, so you can save some time that way, since the burr positions for espresso settings are really not that far apart from each other. So I rotate the burr to the left, have the beans ready, and I press the button on the panel manually. If I rotate it all the way to the left, what usually happens is the coffee wont come out since the burr position is too tight. So just rotate it bit by bit and just keep on doing that until the coffee can be ground. By the way, it’s the 3 springs under the burr that press up, and this causes the Mazzer burr difficult to rotate. If you look at the photos showing the grinding result of this grinder, it’s evident how good MM is with minimizing clumping – also known as coffee granules that are formed while it’s coming out from the cone-shaped chute. Although it takes around 20 seconds to grind 10 grams of coffee, the ground coffee that pour into the portafilter and forms a small mountain looks pretty good, even when compared to a dosing result of a doser grinder that piles the coffee like a botched mountain due to the handle attached to it. When I compare the weight of the coffee before and after it’s ground, I am very satisfied – using a digital scale, there is no difference whatsoever – it’s basically 10 grams in and 10 grams out. Of course it’s a different case if you’re using a two-digit digital scale, but for me it’s a very insignificant fact that I’m willing to overlook. The micro adjustment on a stepless grinder is suitable for those who are after precision in coffee grinding. The burr change per millimeter is Mazzer’s strongest point, and their stepless grinder is available with a reputation that exceeds itself. 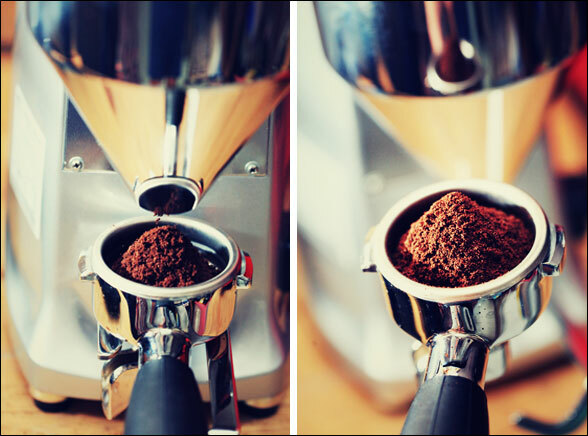 The fork or the portafilter is another feature that you can rely on. Also built with a sturdy material and construction, I have no doubt knocking it about, even though it can get as heavy as half a kg. The Bean Hopper. 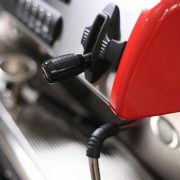 : With a capacity of 0.6 kg, it’s quite sufficient even for a medium-sized coffee shop. Take advantage of the bean stopper to facilitate changing the coffee beans. So what are the cons? It being slow? I don’t mind, really – the grinding takes a relatively longer time but that’s okay, since it’s appropriate as a home appliance that typically has less frequent use. I don’t have patrons breathing down my back and frowning upon me as I prepare their coffee, although more often than not, my daughter – more often than not – demands for a fast-food style service from me. If I may recommend one thing though, is not to have the grinder on when it’s not in use. I’ve tried having it on for 30 minutes and leaving it idle and the electronic panel starts to get warm, which prompts me to turn it off immediately in order to avoid any unnecessary damage. You have to understand – this grinder is on a loan basis, so I have to return it in the same condition I received it. Perhaps it’s one of the most important notes that I found while I tried using this grinder. Kalau Anda melihat foto-foto hasil dari penggiling kopi ini bisa terlihat bagaimana MM sangat minim dengan clumping atau butiran kopi yang terbentuk saat keluar dari chute yang berbentuk kerucut. Walau perlu waktu sekitar 20 detik untuk 10 gram kopi, tumpukan kopi di portafilter dengan bentuk mengerucut tampak sangat bagus, bahkan dibandingkan dengan hasil dosing dari sebuah grinder yang menggunakan doser yang menumpuk ke satu arah akibat sapuan dari handle. Saat saya bandingkan berat kopi sebelum dan sesudah digiling hasilnya sungguh memuaskan, minimal dengan timbangan digital tak ada perbedaan, 10 gram masuk, 10 gram juga yang keluar. 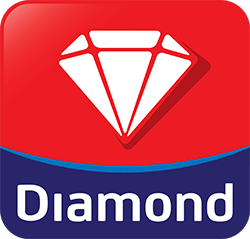 Tentu berbeda bila menggunakan timbangan digital dua digit di belakang, tapi buat saya itu tidaklah signifikan. 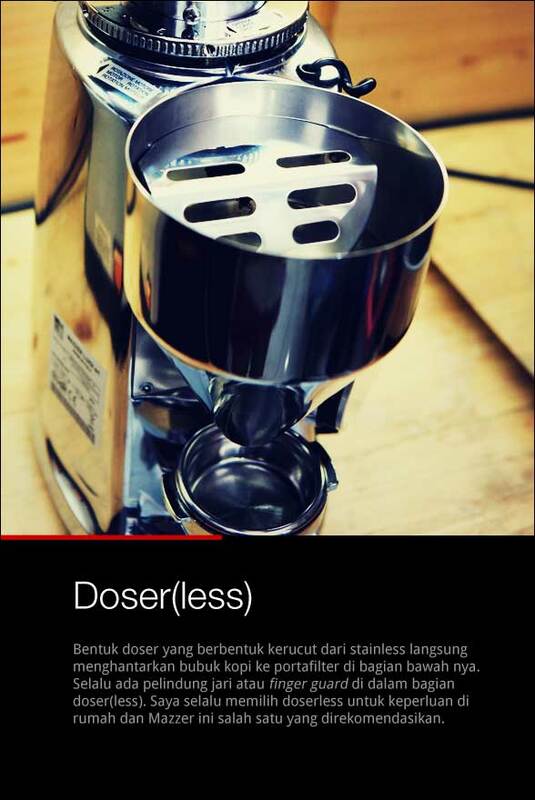 Micro adjustment dalam tipe grinder yang menggunakan sistem stepless cocok digunakan bagi yang ingin lebih presisi mencari kehalusan kopi. Perpindahan kedudukan burr hingga per milimeter adalah keunggulan utama tipe stepless dan Mazzer menyediakan mesin tipe tersebut dengan reputasi merek yang sudah tak diragukan lagi. Fork atau kedudukan portafilter merupakan fitur lain yang membuat kita bisa menempatkannya tanpa terjatuh. Sekali lagi dengan konstruksi yang kokoh hingga saya tak ragu untuk mengetuk-ngetuk porta yang beratnya bisa mencapai setengah kilogram. Stepless : It gives more freedom for the operator to adjust the ground setting as needed. 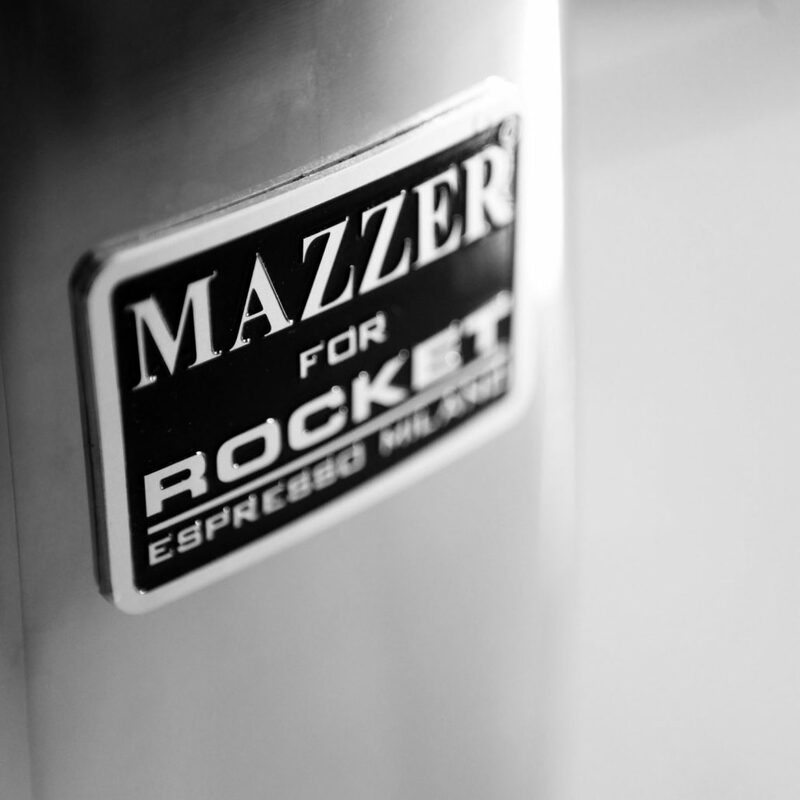 Mazzer is famous for the quality of its materials, so no sweat in sliding the burr. I recommend modifying the small lever to a longer and sturdier one so you can add more momentum to the spin. Sudah banyak produk yang di-unbox selama empat tahun usia blog ini. Saya percaya Anda tidak menjadikan tulisan saya sebagai bahan rujukan utama, karena masih banyak situs lain yang melakukan ulasan yang lebih lengkap untuk digunakan sebagai bahan pengambil keputusan. 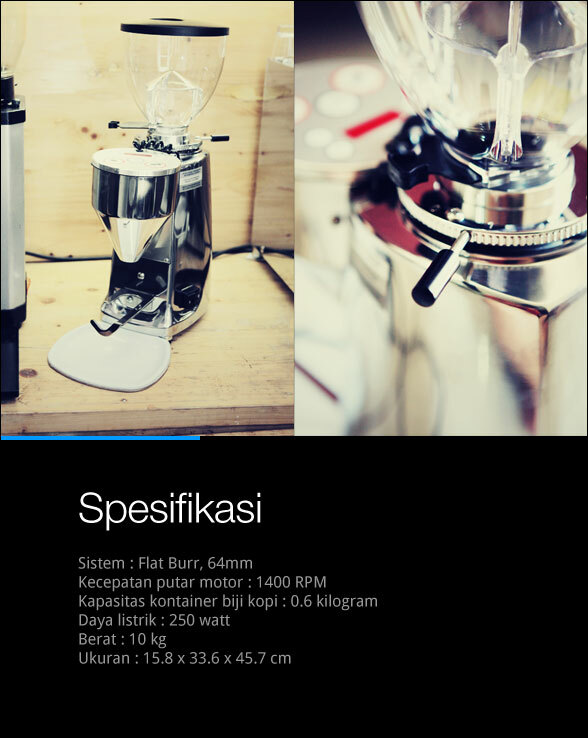 Kali ini “Mazzer Mini Elektronik Tipe A” yang merupakan dari salah satu produsen grinder yang sudah menjadi rujukan untuk kalangan profesional dan home barista. Tapi grinder yang saya bongkar adalah re-branding dari produsen Rocket serta tidak ada perbedaan dari sisi spesifikasi, kecuali ya labelnya itu. Mazzer tidak punya distributor khusus, jadi siapa saja bisa mengimport grinder ini yang rentang harganya hingga 30 jutaan untuk produk high-end mereka, Robur Electronic. Tapi khusus untuk produk yang ditempeli label Mazzer for Rocket diageni oleh PT Tritama Kawanmas yang juga mendatangkan mesin dengan merek yang sama (dulunya ECM). 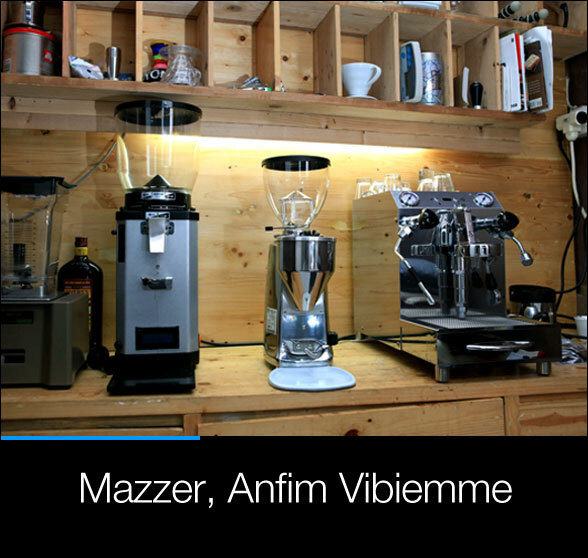 Untuk keperluan penulisan artikel ini untuk selanjutnya saya akan menyebut dengan nama yang sudah dikenal saja yakni Mazzer Mini (MM). 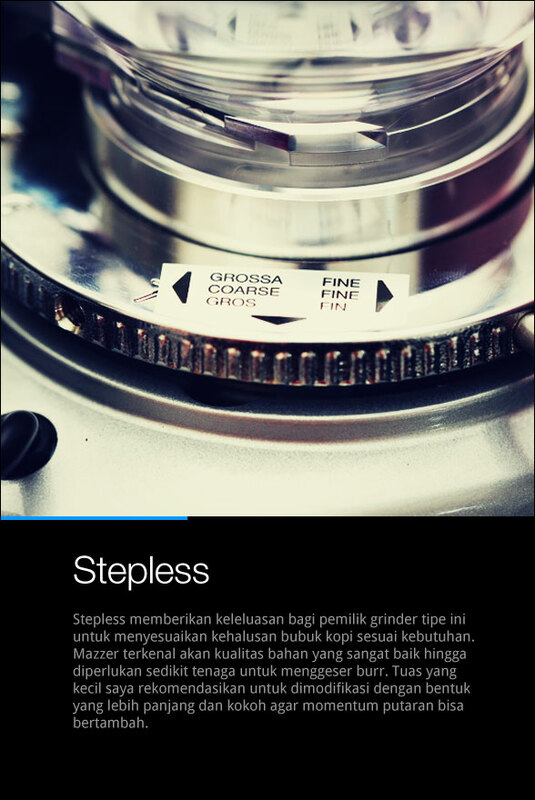 Secara garis besar tipe Mazzer Mini terdiri dari doser dan doserless atau yang punya kontainer bubuk kopi dan tidak. Untuk yang doserless dibagi lagi menjadi dua jenis yakni tipe A dan tipe B dengan perbedaan pada panel elektronik (Tipe A) dan tanpa panel (tipe B). 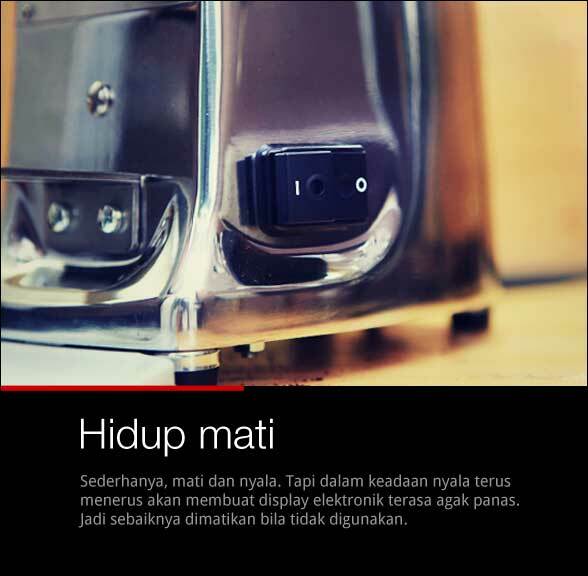 Pada tipe B pengaturan timer dilakukan secara manual melalui sekrup yang diputar untuk menambah atau mengurangi waktu dosing beserta switch otomatis yang akan mengaktifkan grinder saat portafilter ditekan di bawah doser. Membuka kardus Mazzer seperti mengembalikan kenangan saat pertama saya mulai menjelajahi rimba kopi dan membaca berbagai ulasan tentang produk yang ramai dibicarakan ini. Dulu rencananya akan dipasangkan dengan Rancilio Silvia sebagaimana yang banyak dilakukan oleh para pelakon home barista lainnya. Tentu Silvia dan Mazzer Mini adalah pasangan yang ideal, walau harga grinder-nya lebih mahal dari mesin espresso, sesuatu hal yang malah saya anjurkan. Tentu Anda ingat akan pendapat yang saya selalu pegang, dahulukan grinder sebelum membeli mesin atau alat kopi apapun dan sediakan anggaran yang berlebih untuk keperluan alat ini. Rocket membalut MM dengan lapisan chrome mengkilat dan kualitas craftsmanship yang prima langsung terlihat dari setiap sudut grinder ini. Mulai dari atas, kedudukan bean hopper atau kontainer biji kopi yang terbuat dari plastik bening sangat ideal volumenya dengan kapasitas 0.6 kilogram. Bean catcher merupakan kelengkapan yang tersedia pada kontainer ini untuk memudahkan penggantian kopi. Tingginya yang 45 cm salah satunya adalah untuk mengakomodasi kabinet dapur rumah agar alat ini bisa di letakan di bawahnya. Di bagian tengahnya terdapat burr collar yang berfungsi untuk mengatur halus-kasar kopi dengan pegangan yang panjangnya hanya sekitar 7 cm. Terdapat stiker berupa anak panah yang menujuk ke kiri untuk menghaluskan (fine) dan ke kanan (coarse). Cobalah geser bagian ini dan Anda akan mendapati bagaimana tak mudah melakukannya dan perlu sedikit tenaga agar kedudukan burr bisa diubah. 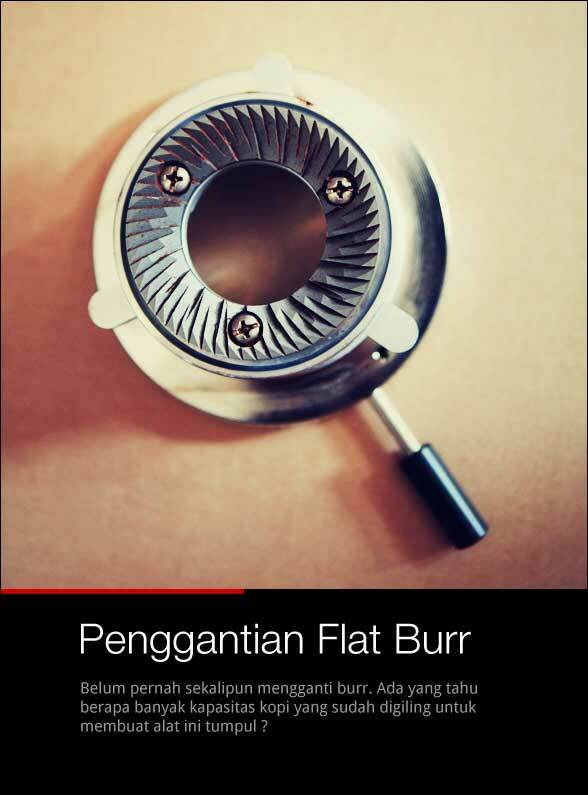 Dari banyak grinder yang sudah saya coba, perubahan burr yang paling memerlukan tenaga untuk memutarnya pemegang rekornya adalah Mazzer. Sekrup limiter bisa digunakan untuk mengencangkan kedudukan burr collar agar tak mudah berubah. 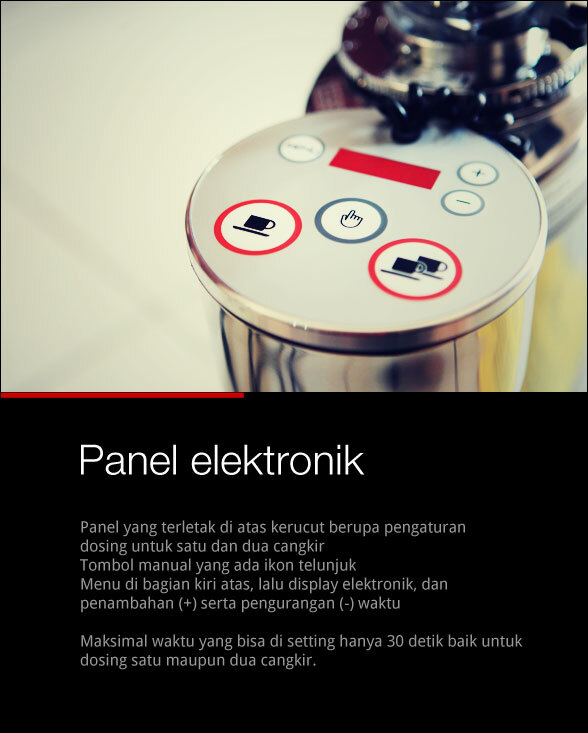 Mari kita ke bagian ini yakni panel elektronik yang merupakan dapur utama grinder MM. Pada bagian ini kita bisa melakukan pengaturan waktu atau timer untuk dosing 1 dan 2 cangkir saji. Terdapat tombol “MENU” yang harus ditekan, lalu setelah panel menunjukan ( _ _ _ _ ), tekan tombol “satu cangkir” lalu atur watu yang dikehendaki. Terdapat empat digit angka dengan hitungan dua desimal, misalnya 15.35 . Perubahan hanya dimungkinkan dengan naik/turun sebesar o.5 detik dengan menekan tanda (+) dan (-). Sayangnya waktu maksimal yang dimungkinkan terbatas pada angka 30.00 detik dan setelah itu akan kembali ke “0”. Saya mencoba untuk 10 gram dan MM memerlukan waktu sekitar 20 detik, relatif lambat bukan ? Mungkin Anda punya pengalaman yang sama dengan saya saat pertama kali dengan bersusah payah untuk menemukan kehalusan bubuk kopi yang sesuai. Saat itu saya memutar burr dari yang paling kasar dan menghabiskan waktu 30 menit untuk akhirnya mendapatkan kehalusan bubuk kopi yang sesuai. Cara tersebut atau memulai dari setting kasar ternyata tidaklah efektif dan akhirnya dibalik dengan memulai dengan memutar grinder ke arah bubuk kopi paling halus. Sedikit demi sedikit burr diputar dari titik halus tersebut hingga lebih menghemat waktu karena kedudukan burr untuk setting espresso biasanya tidak jauh-jauh kedudukannya. Jadi burr saya putar ke arah kiri, biji kopi siap, dan tekan dulu panel dengan cara manual. Biasanya bila diputar hingga habis, kopi tidak akan keluar karena kedudukan burr yang terlalu rapat atau sempit. Pindahkan sedikit lagi dan demikian seterusnya hingga kopi bisa digiling. Oh ya, mekanisme 3 buah per yang berada di bawah burr dan menekan ke atas hingga mengakibatkan burr Mazzer tak mudah diputar. Lalu apa kekurangannya ? Lambat ? Saya tidak berkeberatan dengan waktu giling yang relatif lama karena grinder ini memang cocok untuk skala rumahan yang frekuensi penggunaannya tak terlalu tinggi. Toh saya tidak punya konsumen yang mengerutkan dahi menunggu pesanan kopinya datang walau kadang anak saya sangat ingin dilayani ala restoran fast food. Tapi satu hal, kalau boleh saya anjurkan, untuk tidak menyalakan mesinnya terus menerus bila dalam keadaan tidak digunakan. Saya sudah mencoba selama 30 menit lalu didiamkan dan panel elektronik mulai terasa hangat dan langsung dimatikan untuk menghidari kerusakan. Maklum barang pinjaman ini harus diperlakukan dengan penuh kehati-hatian serta harus dikembalikan dalam keadaaan sedia kala. Mungkin hal tersebut salah satu catatan yang saya temukan selama mencoba mesin giling kopi ini. Saya percaya bila Mazzer Mini ini adalah alat yang saya rekomendasikan untuk Anda. Alat ini bisa menjadi teman setia dalam jangka waktu sangat panjang, selalu memberikan layanan prima, presisi, dan terkenal karena kehandalannya. Doserless. 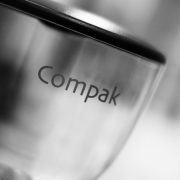 : The cone-shaped stainless steel doser delivers the ground coffee directly to the portafilter underneath. A doserless grinder is always equipped with a finger guard within the doser itself. I always opt for a doserless grinder to be used at home, and Mazzer is one of those grinders I recommend for home appliances. Changing the Flat Burr : I haven’t actually done this at all. Does anyone know how much grinding will it take to wear it off? 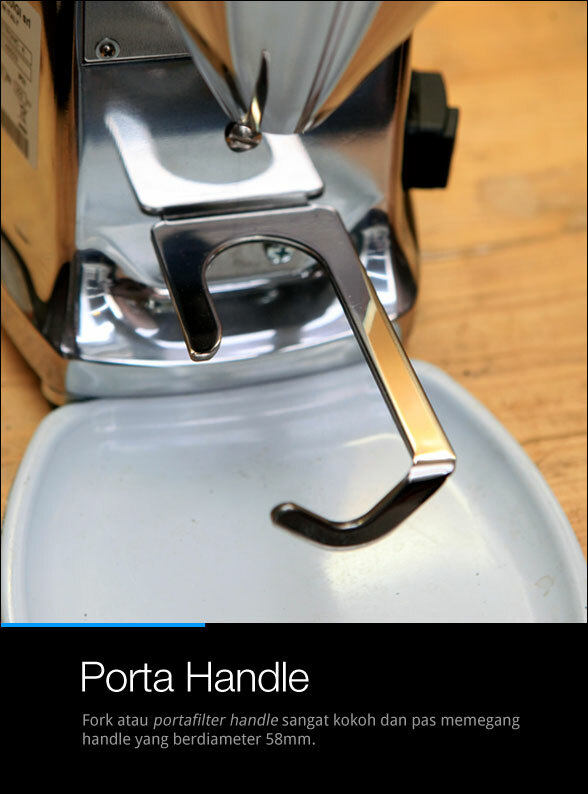 Porta Handle. : The fork or the porta handle is very sturdy and the 58 mm diameter handle fits right in my hand. If it’s continually turned on, the electronic display will feel slightly hot, so I suggest turning it off when not in use. 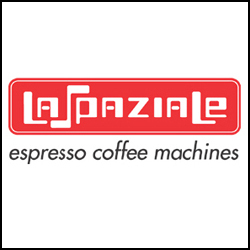 I don’t mind its speed limitation – which is 10 seconds for 10 grams of coffee – because Mazzer always gives the best result with the same consistency. Untuk masalah harga dan pertanyaan lainnya silakan Anda menghubungi PT Tritama Kawanmas di 021-386028.
waktu saya masih kerja di Hotel di Jakarta, pernah ketemu sama Grindernya. ^ Ah, mungkin saya yang salah melihat logonya karena gambarnya “terpotong” hehe..
Pisau lipat yang digunakan untuk membuka kardus di gambar nomer 2 itu merk Wenger bukan Pak? – betul, dengan waktu dan 1 shot sekitar 20 detik (10 gram). kayaknya pernah liat niih mesin.. dimana yaa ? L nya itu yg bikin syereem.. ring merah ya pak ? ngiler nih sama yang ini…. Btw. Fotonya pakai lensa apa nih pak Tony? Bokehnya mantap… kaya pakai 50mm?